What is Cyber Bullying — Bullies Keep Out! 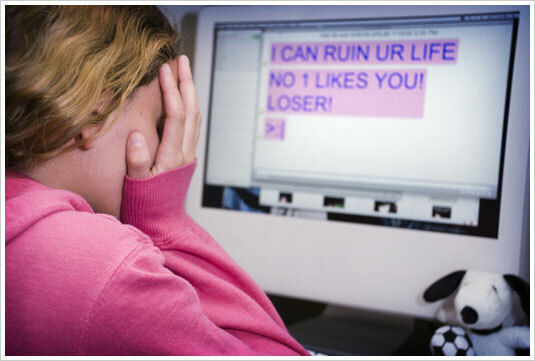 Cyber-bullying is bullying that takes place using electronic technology. Electronic technology includes devices and equipment such as cell phones, computers, and tablets as well as communication tools including social media sites, text messages, chat, and websites. Examples of cyber-bullying include mean text messages or emails, rumors sent by email or posted on social networking sites, and embarrassing pictures, videos, websites, or fake profiles. Please note that the same applies to adults. There is no real difference in behavior with the exception of the intensity possibly varying. Kids who are being cyber bullied are often bullied in person as well. Additionally, kids who are cyber bullied have a harder time getting away from the behavior. Cyber-bullying can happen 24 hours a day, 7 days a week, and reach a kid even when he or she is alone. It can happen any time of the day or night. Cyber-bullying messages and images can be posted anonymously and distributed quickly to a very wide audience. It can be difficult and sometimes impossible to trace the source. Cell phones and computers themselves are not to blame for cyber-bullying. Social media sites can be used for positive activities, like connecting kids, friends and family, helping students with school, and for entertainment. But these tools can also be used to hurt other people. Whether done in person or through technology, the effects of bullying are similar. Please remember that we are all human beings behind our computers and no matter who you are, words hurt and do damage. Be kind. Having an opinion and attacking someone are two completely different things. It is easy to bully when you are not seeing the person or in front of them. You wouldn’t want it to happen to you or someone you loved and cared about, so we need to make sure we remember this. Think before you post, tweet, or make comment to someone. Online social media it is important to save any and all cyber bullying posts, tweets, messages, and emails. Do not stay silent. Speak up and get any and all help you can through organizations and the law. We are all here to help. Know that cyber bullying, harassment, and stalking are all against the law and is not tolerated. If you feel you are in any danger, please make sure you take the proper steps required. The 2008–2009 School Crime Supplement (National Center for Education Statistics and Bureau of Justice Statistics) indicates that 6% of students in grades 6–12 experienced cyber-bullying. Research on cyber-bullying is growing. However, because kids’ technology use changes rapidly, it is difficult to design surveys that accurately capture trends.